Featured: St Clair Alterations Dunedin The client had bought this house because of the huge north facing section. We were asked to enlarge the dining room and build an outdoor living area. 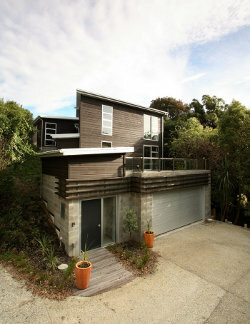 Featured: Janice Place Christchurch Another steep site, with sylvan views through a gully to the ocean beyond. katipo design is a Dunedin-based Architectural Design Firm specialising in Residential Buildings on difficult sites with amazing views. Katipo Design is a Dunedin based Architectural Design Firm specialising in New Homes, on any site, and enriching your lifestyle. Being South Island born and raised has strongly influenced our approach to design, which usually revolves around maximising the light and sun into a building. As our experience has been predominantly in the hill suburbs, we try to 'ground' our buildings with tactile structural components reaching all the way to the solid earth. Light and flimsy construction is not us. Our focus in the last couple of years has been on exposed concrete block, and cedar weatherboards. These materials look fantastic now, and with age they still look great. Our understanding of these materials and detailing means we are efficient at producing the drawings and weatherproofing details. Our Director is a licensed building practitioner. We hold recognised professional qualifications, and undertake continuing professional development. We can provide a range of design services, from conceptual sketches sufficient for a quantity surveying estimate, right through to full working drawings with even the cabinetry hinges specified. Most of our Clients opt for working drawings sufficient for building consent, and choose the finer details such as skirtings etc themselves. One of our designers has experience in shop fitout and restaurant design work and he loves to bring this flair to our residential work. Although in the past we have done a lot of alteration jobs for clients, we are doing more new houses now. This is probably because changes in government policy now require far more drawings from the design company and the increased costs associated with this put people off doing renovations. However, if you have a good house, with good bones, in a good area, then it is definitly worth spending extra on good design drawings to ensure you get a fantastic result. You can contact us by calling 03 477 0462 option 1. Alternatively you can email us from the Contact Page.